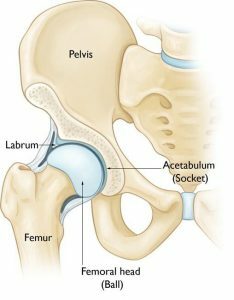 Femoral acetabular impingement (FAI) refers to a set of signs and symptoms that culminates with pain in the hip and groin in young adult and athletically active patients. In FAI, the hip bones do not fit or articulate properly. This is due to the abnormal shape of the ball and socket-like hip joint (often associated with “bone spurs and labral tears”). The labrum is a strong ring of fibrocartilage that forms a gasket around the socket, helping to provide stability to the joint. The diagnosis of FAI is made by assessing the patient’s clinical history, physical exam, and available imaging studies. Unfortunately, the average time from onset of symptoms to diagnosis can often be as high as 3 years. Furthermore, most patients with this diagnosis see 4 healthcare providers before seeing an orthopedic surgeon for definitive diagnosis and treatment. • CAM Type – This type of deformity is characterized by an abnormally shaped or contoured femoral head (ball). The misshapen femoral head contacts the acetabulum rim with the hip flexed up and adducted. This bump leads to repetitive injury including tears of the labrum, grinding injury to the articular cartilage, and detachment of the cartilage. • Pincer Type – This type of deformity is characterized by an abnormally deep or abnormally shaped acetabulum (deep or misshapen socket). This results in too much coverage of the femoral head (ball). Subsequently, range of motion is limited as the femoral neck contacts the acetabulum, typically in hip flexion. Consequences include injury to the articular cartilage and tearing of the labrum. This results in pain the groin/hip region. 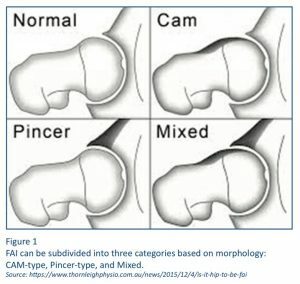 • Mixed Type – This is the most common type of FAI pattern encountered and is a combination of the abnormally shaped femoral head (CAM lesion) and an abnormally shaped or contoured socket (Pincer lesion). A few theories have been proposed. It is likely that FAI occurs because the hip bones do not form entirely normally during the childhood years. There is some suggestion that it is associated with a high level of athletic participation during childhood and adolescence. The diagnosis is made by analyzing your history and activity level as well as a thorough physical examination and evaluation of imaging. An orthopedic hip or sports medicine subspecialist should be consulted for further evaluation and interpretation of your results. Imaging may include x-rays and a magnetic resonance imaging (MRI) scan with or without contrast dye. 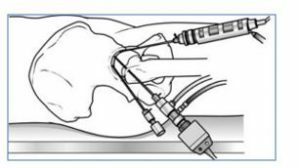 Sometimes an injection of local anesthetic is done into the hip joint to confirm the source of the pain. • Hip joint injection – steroid injection to reduce inflammation; treatments such as Platelet Rich Plasma (PRP) and Bone Marrow Aspirate Concentrate (BMAC) and hyaluronic acid are available and may help, but they are still being studied for their efficacy. You should talk to your orthopedic subspecialist about these. • Physical therapy – specific core strengthening exercises to try to help tilt your pelvis “up” have been shown to reliably relieve symptoms. The key is to keep doing these exercises to maintain their benefit. After the hip scope, the surgeon may restrict your weight-bearing on the one leg for up to 6 weeks. Return to athletic activity is typically at 3 months. The patient’s participation in physical therapy for hip and core strengthening exercises is critical to the post-operative clinical success. Studies available suggest that a significant number of patients with FAI will improve with non-operative conservative treatment strategies discussed above. With proper patient selection from an orthopedic subspecialist, those who undergo hip arthroscopy are also likely to experience pain relief in the short to mid-term. Overall, if you are appropriately selected for the surgery, there is a good chance that your pain in your hip joint will improve and your activity level will increase. It is important to discuss anticipated outcomes with your orthopedic subspecialist. FAI is a common cause of hip pain in young adults and active patients. It often goes unrecognized and untreated. Prompt referral to an orthopedic surgeon is an important part of the evaluation for this pathology. FAI may lead to early degenerative arthritis of the hip, so a delay in diagnosis should be avoided. The first line of intervention consists of physical therapy, a variety of injection options and other non-operative measures. The second line of intervention consists of minimally invasive hip arthroscopy with debridement and repair. When patients are properly evaluated by the orthopedic subspecialist, patient outcomes are positive. Orthopedic interventions can improve the quality of life by reducing pain and restoring function in those who suffer from hip impingement. Shaw, Christopher. Femoroacetabular Impingement Syndrome. Missouri Medicine. July/August 2017. Femoroacetabular Impingement. AAOS OrthoInfo. 2019. Pun S, et al. Femoroacetabular Impingement. Arthritis & Rheumatology. 2015 January; 67(1):17-27.